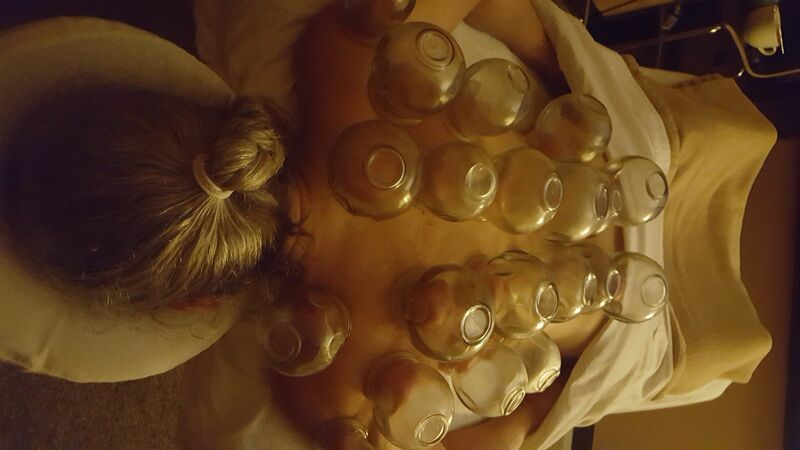 Massage Cupping is the combination of massage movements and negative pressure with the use of a suction device on the skin. A cup is positioned at the area to be treated and, depending on the type of cups being used; a vacuum is created within the cup to draw the skin and underlying tissue into the cup. The produced vacuum creates a suction effect that increases blood and lymphatic circulation systemically and to the local area, relaxes muscle tissue and support, draws stagnation, and pathogenic factors out of the body and releases a myriad of pain causing factors. The intended suction can range from light to heavy. This, along with the movements performed and areas treated by the therapist will produce stimulating (toning) or sedating (draining) effects. It is very important that therapists be able to effectively assess the condition (physical, mental and emotional) of their clients, before the procedure, so they employ the proper application of the cups to produce the desired outcome. The bruising you may notice is not a bruise like tissue damage, but more of dead blood coming to the surface. The more you cup that area the lighter and healthier it becomes. If there is just redness, it's also creating blood flow in the area to facilitate healing. What are the marks caused by cupping? The bruising you may notice is not a bruise like tissue damage, but more of dead blood coming to the surface. The more you cup that area the lighter and healthier it becomes. If there is just redness, it's also creating blood flow in the area to facilitate healing.